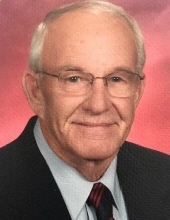 Floyd L. Isebrands, 91, passed away on March 21, 2019. Born in Des Moines, Iowa on December 13, 1927 during our country’s depression, he and his brother, Robert Snyder, were placed in a children’s orphanage. From there, the two brothers were placed in several foster homes and Floyd was later adopted by Gerhard and Grace Isebrands at the age of nine. He grew up and attended school in Kamrar, Iowa where he graduated from high school in 1946. Floyd served in the U.S. Army as a paratrooper with the 11th Airborne Division in the Occupation of Japan following the end of World War II. After he returned home, Floyd met Shirley Erickson. In 1953, Floyd graduated from Buena Vista College, majoring in sociology. Soon after, the two married on August 7, 1955. In 1957, Floyd and Shirley had their first son, Mark, and later began the family fur business in 1960. In 1970, they were blessed with their second son, Tom. Known as ‘Ise’ to his friends, husband, dad, and grandpa, he not only often cited facts about the world, geography and history, but he was also chalk-full of stories, provided humble advice and cracked jokes that always seem to hit. Determined and quick-witted, Floyd led by example and was a diligent listener. Those who knew him well, knew a box of chocolates or cigarettes was never far from reach. Floyd truly appreciated the small things in life and cherished nothing more than time with his wife spent on the farm. His fishing boat was always tidied and ready for those summer afternoon boat rides with Shirley, or quick trips up North. He appreciated the changing of the seasons, and never let the lawn go unpolished. His pride was his family. Some of their fondest times included ski trips and lake excursions. Due to the family business, they were fortunate to enjoy dinner together daily. Always equipped with a clever grin on his face when his grandchildren were around, he would do anything to bring them joy. Floyd is preceded in death by his parents, Gerhard and Grace; brother, Robert; and son, Tom. Left to cherish his memory are his wife Shirley; son Mark (Gina); daughter-in-law Amanda; grandchildren Katie (Dylan), Molly, Jana and Tyler, as well as many extended family members. A celebration of Floyd’s life will be held Friday, March 29, 2019 at Bethesda Lutheran Church in Jewell, Iowa at 11:00 a.m. with a visitation at 10:00 a.m. preceding the service. The family has designated Jewell Fire and Rescue and Bethesda Lutheran Church in Jewell, Iowa for memorial contributions. To send flowers or a remembrance gift to the family of Floyd L. Isebrands, please visit our Tribute Store. "Email Address" would like to share the life celebration of Floyd L. Isebrands. Click on the "link" to go to share a favorite memory or leave a condolence message for the family.